When it comes to the packaging of foods, be they for raw, processed or cooked foods, various types of packaging are available. As elucidated in the previous article, food packaging must contain elements of protection, freshness and containment and the most common packaging materials used by food operators and businesses which contain these elements are plastic, aluminium and cardboard. Other materials include glass, paper and metal. 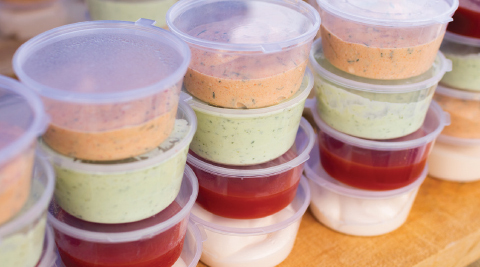 Let’s take a look at the different types of packaging for raw foods, processed foods and take-away foods below. Raw foods, as you may already know, are foods that are uncooked and may contain harmful bacteria that can spread very easily. Raw food can be anything from green leafy vegetables, beans, nuts and seeds to fish, chicken or meats. To keep food fresh and stop bacteria from spreading, raw foods must be packaged and stored correctly. To protect the fragile ingredients in raw foods, especially meats, food operators usually use synthetic packaging (usually opaque packaging) to prevent light from hitting it and degrading the ingredients. There are various other types of synthetic packaging films (mainly in the form of plastic films or foils) available including, transparent, flexible or semirigid films and gas proof films that are permeable to certain gases. These materials are also selected to serve purposes such as, protection from unwanted impacts or attractive presentation. Packaging films must also be flexible, light weight, odourless, hygienic, easily-recyclable, resistant to hot and cold temperatures, resistant to oil and fats, and have good barrier properties against gases, sealing capability and mechanical strength. Transparent packaging films normally used for raw food products are attractive as the packaged product is visible but don’t provide much protection against daylight or artificial light which can accelerate unattractive colour changes, oxidation and rancidity of raw foods. Normally products in transparent packaging films are sufficiently protected when stored in the dark or moderate light conditions. For lightsensitive food products or products exposed to strong light, coloured, opaque films or films laminated with aluminium foil are very effective. Vacuum-sealed bags are also used to package raw foods and are composed of two or more sheets of multi-layer films. By drawing the vacuum and sealing of such bags, the air is excluded from the package and the damaging effects of oxygen such as rancidity or discoloration of the packed products will be significantly slowed down or not develop at all. However, exposure to strong light may cause discoloration even under vacuum. place. In such situations, the type of packaging used to contain and protect these raw foods from being contaminated (e.g. by dirt or bacteria) is crucial. Caterers typically pack frozen raw or uncooked foods in vacuum bags, cling wraps, aluminium foil containers or plastic containers and transport them in cooler boxes or containers to be cooked on-site. All forms of raw packaging should be food grade. A probe thermometer should be used to ensure that the temperature of chilled raw food deliveries is less than or equal to +5°C and frozen food is not greater than –18°C. Raw food which is delivered at the wrong temperature must be thrown away. 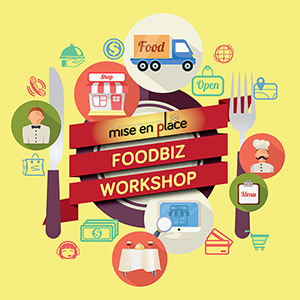 Further information on the catering segment can be found in the Business Sense section of this magazine. When walking through a grocery store, mart or hypermarket, you will notice that the majority of the food found there are processed and pre-packaged. The major categories of materials used for processed food packaging are paper and paperboard, plastic, glass, and metal. There are many multi-layered packaging materials containing either layers of different plastics or combinations of plastics with paper/ board, metal or glass. In many cases, a food product is wrapped in a packaging material containing two layers. Paper and paperboards are one of the most commonly used materials in processed food packaging and are usually found in corrugated boxes, milk cartons, folding cartons, bags and sacks, and wrapping paper. While there is no real difference between paper and paperboard, paperboard is generally thicker and heavier than paper. Paper is a low cost, popular, readily available, and versatile food packaging material. • Kraft paper is the strongest of all paper and is commonly used to package flour, sugar, and dried fruits and vegetables. • Sulphite paper is lighter and weaker than Kraft paper and also used in laminates with plastic or foil. It is used to make small bags or wrappers for packaging biscuits and confectionary. 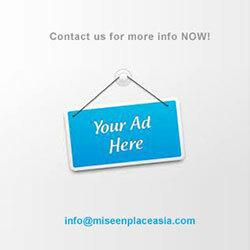 • Greaseproof paper is used to wrap snack foods, cookies, candy bars, and other oily foods. • Glassine (a type of greaseproof paper) is usually used as a liner for biscuits, cooking fats, fast foods, and baked goods. • Parchment paper is impervious to water and oil and therefore used to package fats such as butter and lard. • Laminated paper is used to package dried products such as soups, herbs, and spices. Paperboards come in various types. • White board is used for ice cream, chocolate and frozen food cartons. • Chipboard is used as the outer cartons for tea or cereals but not in contact with foods. It may be lined with white board to improve the appearance and strength. • Moulded paperboard is used as trays for eggs, fruit, meat or fish or for egg cartons. • Small paperboard tubs or cans are used for snack foods, confectionery, nuts, salt, cocoa powder and spices. • Corrugated board or cartons are used as shipping containers for bottled, canned or plastic-packaged foods. Wet foods may be packed by lining the corrugated board with polyethylene or a laminate of wax-coated greaseproof paper and polyethylene, and used for chilled bulk meat, dairy products and frozen foods. Plastic is the most widely used form of food packaging as it is inexpensive, lightweight and holds the temperature of hot/cold food and beverages with physical and optical properties. There is a wide range of plastic bottles, pots, jars, trays and tubs made from rigid or semi-rigid plastic that are increasingly used for processed foods. Cups or tubs for margarine, processed meats, cheese, spreads, yoghurt, peanut butter, dried foods or ice cream and desserts are made from high-nitrile resin copolymers or high-impact polystyrene and acrylonitrile butadiene styrene. Trays for meat products and chocolates or jams are made from polyvinyl chloride. Bottles and jars for fruit juices, squashes and juice concentrates, vinegar, cooking oil, milk, wine, syrup and, and as drums for salt and bulk fruit juices are made from HDPE and polyvinyl chloride. Bottles for carbonated drinks and mineral water are made from polyethylene terephthalate (PET). Squeezable bottles and pots for mustard, mayonnaise, jams, tomato ketchup and other sauces are made from polypropylene coextruded with ethylene vinyl alcohol). Glass has a long history in food packaging with the first glass objects for holding food believed to have appeared around 3000 BC. 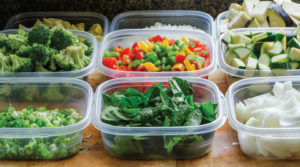 Glass food containers are strong and hardy as they are impervious to microorganisms, pests, moisture, oxygen and odours; they do not react to foods or have chemicals that migrate into foods. Although glass requires careful handling, it is easy to recycle and reuse. 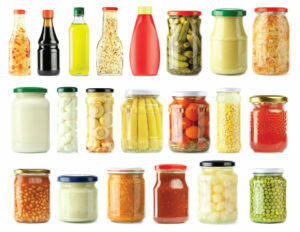 Glass containers and jars are still widely used for foods such as juices, wines, beers, pickles, chutneys and jams. Metals are the most versatile of all forms of packaging. They offer the combination of excellent physical protection and barrier properties, formability, decorative potential, recyclability, and consumer acceptance. Metal containers are vacuum-sealed and thermally sterilized under low oxygen pressure. The decomposition of nutrients is kept to a minimum in metal containers, since metals are a perfect barrier to oxygen, light and moisture. 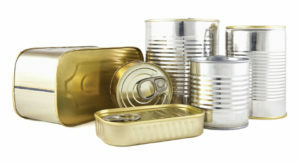 Aluminium and steel are the most predominantly used metals in food packaging. Aluminium foil is used for cartons, pouches, wrappings, bottle capsules, laminated tubes, lids, trays and containers. Tinplate, on the other hand, are air-tight containers that provide excellent barrier properties to gases, water vapour, light, odours. It is commonly used to store processed foods such as canned tuna, sardine sauces, soups, tomato juice, baked beans, ham, peas and sardines. In the current fast-paced environment that we live in, many people choose to eat-on-the-go and receive their packed foods in disposable food packages from food outlets and restaurants. These take-away food packages must of course be functional and provide a safe and insulated environment to keep the food in the best state for the customer. On top of this, the take-away food packaging should be lightweight, comfortable to hold, easy to carry (if you don’t include a bag for example), simple to put together, and could be used to help promote a business’s identity via the use of bespoke print. Take-out packages are usually made from a number of materials, each with its own uses and benefits. The most widely used type of take-out food packaging is made fromplastic i.e. plastic cups, plates, bowls, cutlery, trays, and food containers. 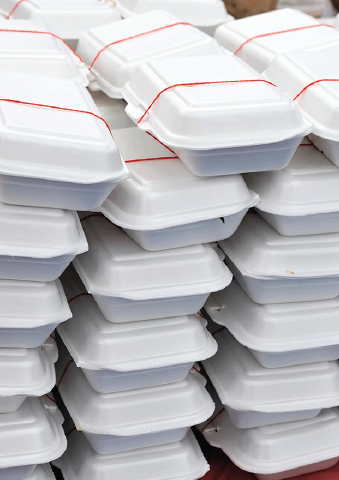 There are various types of plastic food packages but polypropylene (PP) is commonly used in the food service industry as it is strong, lightweight, foodgraded, and an easily recyclable. In addition to having excellent resistance to stress and cracking, Polypropylene plastic containers are also microwave and dishwasher safe, and are usually non-toxic and non staining. Another material used to take-away food is paper and paperboard packaging. 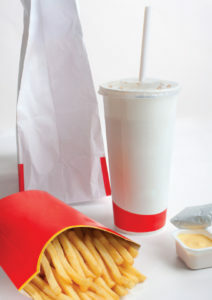 Food packaging such as pizza boxes, French fry trays, Chinese noodle soup boxes, burger boxes are usually made from paper and paperboard or moulded pulp products. 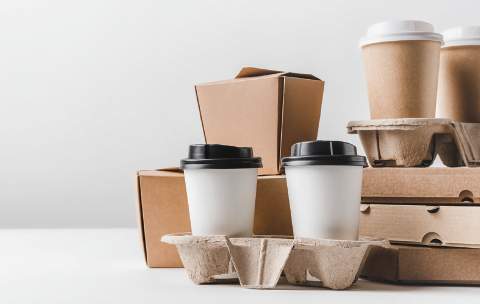 A number of manufacturers are now also using an alternative material known as Polylactic Acid (PLA) to make disposable foodservice products such as cups, plates, bowls, cutlery, sandwich wraps, food containers and trays.